As far as coups go, signing up with Under Armour is pretty big, we will make no bones about that. The Maryland-based firm surpassed Adidas as the second biggest sportswear brand in the USA last year, behind only Nike, and the company who virtually invented the compression base layer have only got three major kit deals in the Northern Hemisphere; Top 14 outfit Clermont Auvergne, Premiership football team Tottenham Hotspur and most prominently with the Welsh Rugby Union national side. Well now make that four, as Salford did nothing to dismiss the philosophy of doing things differently under the stewardship of Koukash, by agreeing a reported million pound deal with the American manufacturer who were founded in 1996 by the wonderfully named Kevin Plank. Of course in typical Koukash style the new kits were unveiled amidst grand fanfare, but do they live up to the undoubted hype that this agreement has caused? One instantly noticeable feature is that the name Salford has disappeared from the menacing looking club crest. A shame, but for us just a minor detail as from an aesthetic point of view, the home shirt is one of the best of a very mixed 2015 Super League bag. The abstract front, shoulder, and side panelling is very synonymous with any Under Armour design, this arrangement meaning the makers branding, sponsors, and team emblem are all very prominent and not placed haphazardly on the shirt, this implies to us that real thought has gone into the design which is pleasing to see. The use of black is another possible bone of contention as Salford seem to have chopped and changed between that and white in recent years, however, with a deeper hue of red used in last year’s Kooga production, we wonder if black is a better accomplice to the new darker primary shade. Although supporters may not consider this a traditional Salford combination, a quick look back through the Devils kit cupboard will see it has been used before, and with success too, the 1997 Joe Bloggs Cebora shirt a stand out example. 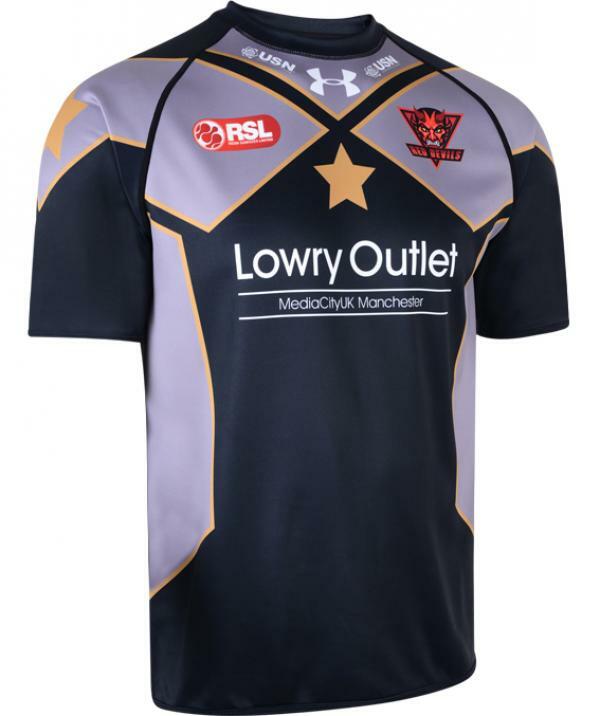 For the alternate offering, Salford have stuck with the colour scheme used on Dr Koukash’s jockey silks, grey and gold. Black is also featured in this ensemble too making for an altogether unique appearance, although the inclusion of grey in any playing apparel generally doesn’t herald satisfactory results, with this shirt doing nothing to dispel that theory. Also the chest and sleeve stars are for us, a wholly superfluous addition that adds further weight to a feeling of disappointment compared to the principal production. The only real positive we can draw from this secondary offering is it being a simple reverse of the home, something that was hugely prominent in rugby league during the pre Super League era and is rarely seen nowadays. 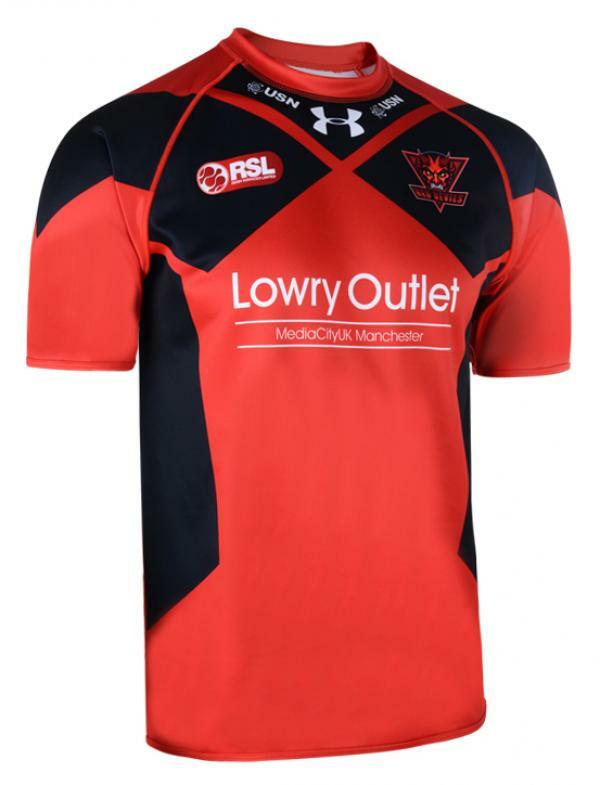 All in all though, regardless of Salford only perhaps getting things right with one of their shirts for 2015, the Devils faithful should be pleased once they realise who they have jumped into bed with, the figures involved, and the quality of product which Under Armour are renowned for in many other sports.